JVC is a very respected name in consumer electronics. Its standing may not be as tall as Sharp or Sony’s in the LCD market, but JVC delivers quality 1st Tier LCD TVs at a lower costs than other 1st Tier Japanese manufactured competition. Color performance with DVD material was impressive. 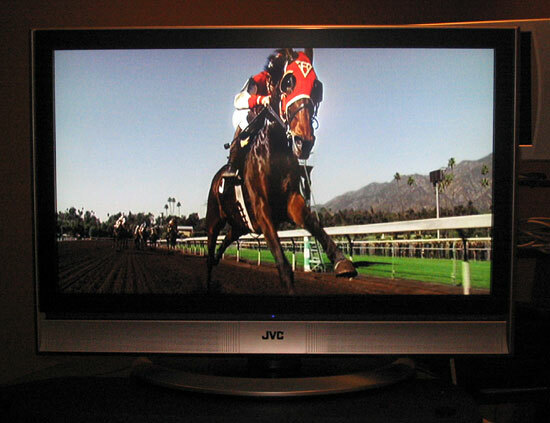 We were pleased with the picture quality of digital broadcast material on the JVC LT-X776 series. Still images were displayed with great precision and our LT-37X776 handled animation and video gracefully. The built-in ATSC tuner worked well and we had no problem pulling in digital broadcast and HD signals. The picture was occasionally grainy but overall clarity was very good. The picture obtained from the NTSC tuner was predictably worse, but, with a strong signal, quality was top-notch. Fast-action melees on the Jerry Springer Show posed little problem for the TV's 15-millisecond response time. The LT-37X776's adept motion handling was reaffirmed later watching Terminator 2, Judgment Day in HDTV. The JVC LT-37X776 LCD TV supports four aspect ratio settings when displaying 480p or 480i signals, including those from the built-in tuner. Panorama stretches a 4:3 source horizontally and vertically to fill a 16:9 space, keeping the center portion of the picture’s aspect ratio correct. This setting displays 1.66:1 content at full screen, using a variable stretch that is gentle and unobtrusive. It is ideal for watching NTSC broadcasts at full screen. The cinema setting zooms in on the center portion of a 4:3 source, blowing up letter-boxed content (1.85:1) to full screen with no distortion and no cropping. Cinema zoom further enlarges content and a final setting performs no scaling. The LT-37X776 LCD comes with a host of auto-picture adjustment settings designed to improve the LCD TV's handling of challenging material. Smart Picture monitors the average picture level, the overall brightness of an image, and adjusts picture properties to obtain the best image. With this feature active we were blinded less-often by very bright scenes. Dynamic Gamma is supposed to enhance dark matter detailing in dark scenes. We observed increases in contrast with this feature active, but no increases in actual detail on the LCD screen. In some cases Dynamic Gamma rendered lighter areas of dark scenes artificially bright. While watching a scene in Seabiscuit where a boy rides a horse alongside a white fence during the night, the Dynamic Gamma setting made the illuminated portions of the fence appear to be sunlit while the rest of the scene remained pitch black. The Color Management function compensates for dull colors to ensure natural hues, according to JVC's literature. We briefly tested the feature using DVD and broadcast content and saw no noticeable differences in picture. I think Color Management is just another fluff feature wasting menu space and consumer's time. The digital tuner, with its separate input, was obviously an afterthought. On initial plug-in the TV's fan runs briefly. The fan turns off about a half-minute after the TV is plugged in. We suspect when things get really hot it turns on, but during 6 six consecutive hours of use our set never heated up enough to reach that threshold. When the TV is turned on for the first time users are greeted with an "interactive plug in menu". Time, date, time zone, daylight savings, and cable inputs are configured during this initial setup. While the configuration is straightforward, it isn't pretty. The JVC LT-37X776's menu system uses a block-type, mono-spaced font that looks too dated for a high-end HDTV in 2005. The electronics are silent during operation. The LT-32X776 LCD consumes 173 watts of power during operation and the LT-37X776 consumers 202 watts. 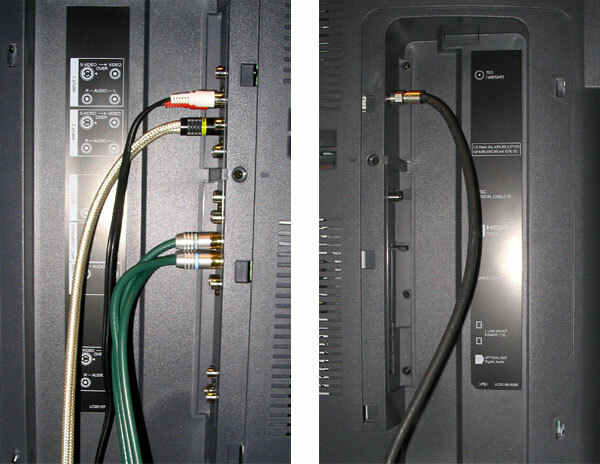 The JVC LT-X776 LCD TV series are assembled in Mexico and made of parts from Japan. With its stand the 37-inch LCD flat panel is just over 27 inches tall, 36 1/2 inches wide, and 13 inches deep. The 32-inch LT-32X776 is just less than 32 inches wide, 25 3/4 inches tall, and 12 1/4 inches deep. At introduction the street price of the 32-inch LT-32X776 is about $2300, the LT-37X776 arrives at $2,900. Non-technical buyers may be more comfortable with the ease of use of a Sharp or Sony LCD. It may take longer to learn how to operate but what better to do on a Sunday afternoon in the summer. The LT-32X776 or LT-37X776 LCD offerings are excellent when considering the price/quality ratio.